View larger. | ALMA image of the protostar MMS5/OMC-3. The slow outflow is shown in orange and the fast jet is shown in blue. You can see that the axes of the outflow and jet are misaligned. Image via ALMA. 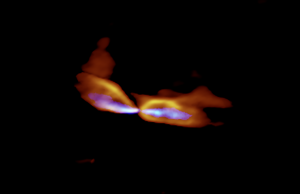 The origins of these two flows have been a mystery, but these observations provide telltale signs that these two streams were launched from different parts of the disk around the protostar. Stars are born in clouds of gas and dust. Baby stars, or protostars, collect the gas with their gravitational pull; however, some of the material is ejected by the protostars. The astronomers said this ejected material forms a “stellar birth cry” that provides clues to understanding the process of how newly forming stars accumulate mass. View larger. | Artist’s concept of the baby star MMS5/OMC-3. ALMA observations identified two gas streams from the protostar, a collimated fast jet and a wide-angle slow outflow, and found that the axes of the two gas flows are misaligned. Image via NAOJ/ALMA.